After traveling to China in 1913, Hirai Baisen began to incorporate traditional Chinese subject matter into his modern Japanese painting practice. The white-walled buildings and the boats of the left-hand screen identify this as a Chinese landscape setting. Baisen, more widely known for his rich use of color, explored the expressive possibilities of ink on paper in this dramatic pair of six-panel screens. This painting was recently installed in the Asian Art gallery at SAM downtown. Chinese Landscape (detail), ca. 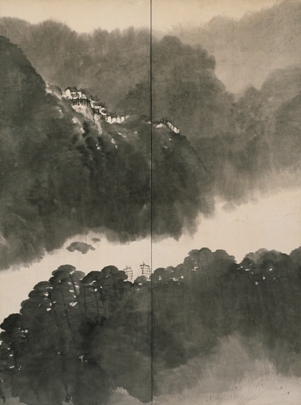 1925, Hirai Baisen, Japanese, 1889-1969, ink on paper, 67 1/4 x 148 1/2 in., Gift of Griffith and Patricia Way, in honor of the 75th Anniversary of the Seattle Art Museum, 2010.41.52.1-2, Photo: Eduardo Calderon. Currently on view in the Asian Art gallery, third floor, SAM downtown.